So many hearts, hopes, and homes are broken by sin. This brokenness infects our culture and invades our lives. God has provided both a deterrent to sin and a means of forgiveness for its guilt: honest and genuine confession of our sin. At the heart of confession is a passion to see sin for what it is in the eyes of God and to be anguished for our participation in it. No wonder confession is so healing (cf. 1 John 1:5-2:2). 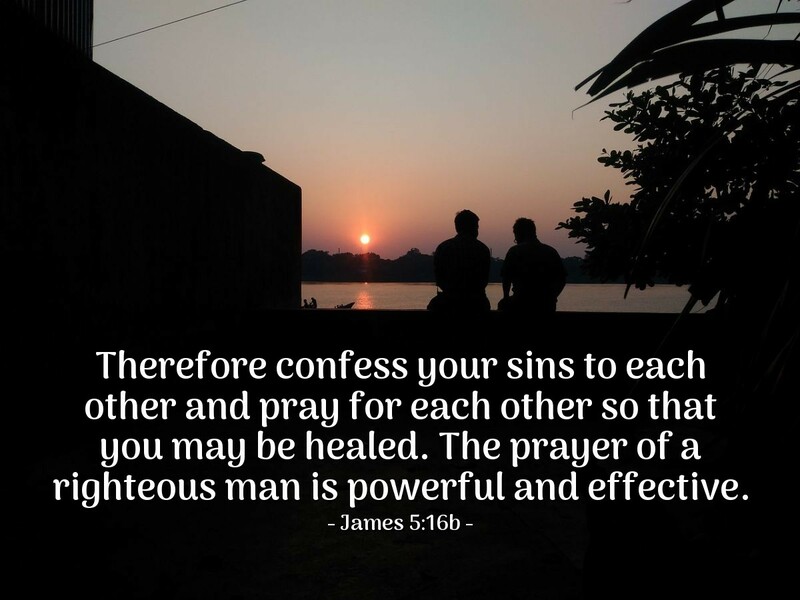 No wonder God wants us to confess our sin to each other and then come to him for each other's healing from sin and its damage. No wonder God grants such power to the prayer of a righteous person interceding for one led to confess. Let's confess our sin and leave it behind. O loving Father, God of holiness and grace, please forgive me for my sin... (list specific sins you need to confess before God). Please lead me, dear Father, to the group of your children with whom I can lay down my burden of sin in confession and know that they will pray for my forgiveness and lead me to greater confidence in the power of your grace and the might of your Spirit to help me overcome the sin in my life. In Jesus' name. Amen.